These new five yard bolts of 25-inch wide cork are due to arrive in March. I got to see them at Market – and couldn’t stop petting them – they really are that special! They now come in designs and colors. Here are just a few examples…..
Pickle Pie Designs have several In the Hoop Designs that support this material. The luggage tags are gorgeous and include vinyl. What a great class – showing them what needles and threads to use to get such eye catching results! Buttonholes and top-stitching? A piece of cake! The coasters would also be great wall decor in a teenager’s room. Can you see their name or school spelled out above a door??? Or “quilt shop”; “classroom” – you get the idea! A little goes a long way. Sue O’Very used it to accent and reinforce the corners on this little purse; and as an accent on the zipper. Just a little adds a touch of class. But let’s not forget the Corky Wallet from Sassafras Lane. It has been in the top 100 patterns for months. What a great Make and Take! Get organized now! Order the cork, the patterns, and designate a space right by the register. They may have questions – and you will be right there to answer them! 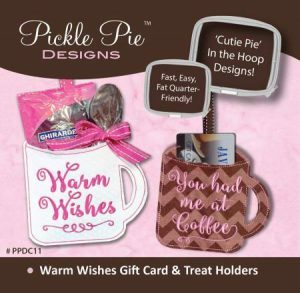 These new designs by Pickle Pie are sure to fill many of your gift giving needs. These are the perfect “little somethings” for those friends and family who make life worthwhile. Warm Wishes gift card and treat holders are the perfect teacher gift. Stick in some chocolate spoons and tie to a favorite to go cup, mug or jar or homemade cocoa mix. Or insert a gift card. Make a bunch – once everyone sees how cute they are, they will want them! Or “Wrap it Up”. 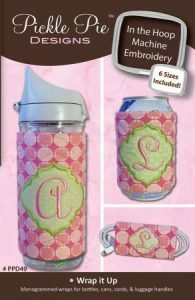 Everyone can keep their drink straight when it is personalized with their initial! 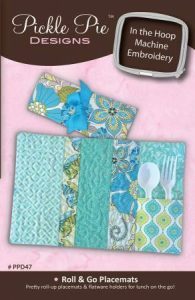 You can wrap up your silverware as well with this portable place mat. Wouldn’t these be a darling addition to a picnic basket gift? These zippered bags are good for everything! 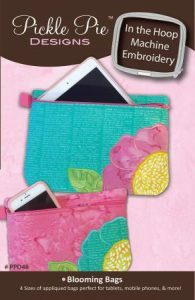 They can literally be the “wrapping paper” for any small gift – and the recipient will like the wrapping as much as the gift! All of these patterns are “in the hoop” designs so they are fast, easy and fun! The patterns are due to arrive next month – plenty of time to plan some Fall classes!